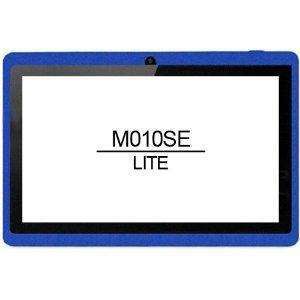 NATPC M010SE Lite Blue 4GB Android Tablet PC Allwinner A13 - Android 4.0 Ice Cream Sandwich - Google Play Store / Android Market - free delivery £34.99 @ Amazon sold by Wendy Lou. Seems a very good price for a basic/starter tablet, for email, general surfing, iplayer , streaming etc.. The latest generation android tablets are here showing an astonishing array of features built-in. Our M010S Capacitive tablet comes with a 7" screen - that most popular of sizes, offering a good balance between desktop space and portability. The capacitive touchscreen offers smooth performance coupled with the ability to "pinch to zoom". No need for a stylus here - finger touch is preferred. The new, A13 processor offers 1.0GHz frequency coupled with a 400MHz dedicated graphics processor to provide seamless play in, even the most intensive, 3D games or allows more apps to be run concurrently without the inevitable cpu slowdown experienced in lesser tablets. Cold,cheep tablets will drive you nuts.don't buy it for the kids either cos they will go nuts.my natcp experience was not great,spend a bit more. These are no good for writing programmes on, or compiling a PHD. For keeping the kids quiet they are superb, well worth it at this price. Download angry brids etc on your PC and pair the tablet, easy, and an hours peace. When the battery runs out they have had enough , natural timewatcher. Kids want more than angry birds to play on a tablet .1ghz is cack ,you will struggle with stuff like YouTube ,and even browsing the web.,"browser not responding" is what your gona see alot. Bought one of these previously, and as already mentioned it drove me nuts. Browser not responding etc. Big lag times when trying to do even the simplest of tasks. Kept using my phone instead as it was quicker and easier. If you adjust your expectations to match the price you won't be disappointed. I bought a cheap tablet from focalprice with the same specs as this and its great. After I've missed out on several deals, I finally wanted to give a budget tablet a try. Can't be thaat~ bad. Beats waiting or taking the risk of FocalPrice. I bought one of these (identical spec and look) from FocalPrice - it was fine for what it is, a cheap tablet. It ran fine, the resolution is a little low for my liking. Web browing was scaled a little on sites (you can zoom in). Who knows, you even get a UK adapter, unlike FocalPrice. Good deal for those looking for a cheapo tablet. Really worth spending more, will be very frustrating to use. These are quite annoying to use. If you have a cheap android phone I will guarantee that it will be more responsive and easier to use than these. I have one same spec and it doesn't get used. 512mb ram may seem good on paper but it somehow isn't. Although so much more I'd still get a nexus7 which is brilliant. Try to think by buying a Nexus you are still saving wasting 35 quid . Had 2 of these delivered yesterday from the same seller. Has anyone tried using one of these cheap tabs as a dumb terminal (running only VNC)? N7 is still king of the 7" tablets. No HDMI or SD if they are important to you though. Best build, screen, weight and OS. I have had 16GB since launch. Recently bought 32GB 'refurb' from Argos/eBay for £124. Never needed the extra 16GB, but at that price I couldn't say no. Passed the 16GB on to family member. How do you get free delivery? It says £34.99 + £4.59 for delivery on my screen. How do you get free delivery? It says £34.99 + £4.59 for delivery on my s … How do you get free delivery? It says £34.99 + £4.59 for delivery on my screen. Agreed, ditch the awful browser that comes with it and put on Chrome. Found it ran a lot better. Amazon still have some of the pink version left in stock at the same price - just change the colour in the drop down box at the top ! Anyone tried Boat browser on this? How long will the battery last on this? I have taken a punt on buying one for the sole purpose of replacing a failed in-car DVD player for the kids. This only has to be able to play standard def video from a micro-sd card and i'll be happy. Hope i can find a way to attach it the back of a headrest! On these tablets with little memory I've tried Chrome & Dolphin and ditched them... Opera Mini is by far the best. It's small and fast. Must say wendy lou is good on returns.but its not the point its cheap for a reason. Great little tablet. Not amazing for 3D gaming or browsing, but perfect for iPlayer, watching videos and I even have mine set up as a web-server and VNC client. It's all good for this money! Can't wait until dual-core tabs come down to this price. I also bought a keyboard case for £5 from ebay and it's really good to use. I bought two from Wendy Lou had some issues with them, caused by the kids. Wendy Lou fixed them and posted them back even replacing a cracked screen free of charge. Cheap and do the job, simples. Thats over 4 times the price of the one here so no comparison. note: the original offer was not Wendy Lou (he is charging slightly more, as you have to add postage). There are no blue ones left, just pink. The seller is Big Tech Direct at a cost £34.99 including postage and is fulfilled by Amazon (in case you have any problems. Wendy Lou also has a good rep for dealing with problems, in case you have ordered from him). Koshba - your link seems to be a tablet of the same spec. Nice find - In blue, £1 cheaper, and still fulfilled by Amazon. Deal posting newbie! This is myself321 first deal post. Help out by leaving a posting tip or just to show your appreciation for their contribution.